Here are our winners for our 2012-2013 4th Grade Ski History Video Contest! We received some great videos from NH schools, including videos that showcased famous NH ski racers, “epic” newscasts, and the history and community of one NH resort. The Lafayette Regional School created a video about the history of Cannon Mountain and its surrounding community. They researched and interviewed local authors, ski area employees (past & present), including John DeVivo the current General Manager at Cannon Mountain, and community members. Their video was well put together and contained historical information and personal experiences. Mr. Ferguson, 4th grade teacher at Lafayette Regional School stated “Not only have we learned how to make and edit a movie, but we can now better appreciate Cannon Mountain that sits in our backyard.” We will be working on posting the winning school video soon. Congratulations to all schools! We look forward to seeing your videos next year! The landmark challenge ended on March 15 and the results have been tallied. For the first time the fourth grade at Lafayette is in first place tied with Oberthur Primary from Bull Creek, Western Australia. Both schools found 30 out of a possible 33 landmarks. The Landmark Challenge is an extraordinary challenge to test your searching skills. It takes you around the world to different landmarks. For three weeks, we received clues from different schools, all over the world about a landmark they have chosen. Our mission is to figure out their landmark using the clues. The fourth graders certainly had a fun and puzzling time figuring them out. They were some really cool landmarks such as Falling Water (look at the display case!). But their were some puzzling ones like the Glass Beach in California. We didn’t figure out that one! Then there were scarier ones like the Winchester Mystery House and the Church of Bones with a chandelier made of human skulls. To learn more about the landmark challenge visit http://www.kidlink.org/drupal/project/landmark. In addition to the landmark challenge the students have been building a scale model of their chosen landmark, the Millau Viaduct. Next week we should be done with our model. Stay tuned for more pictures. In the month of February, students have been working on several projects. Landmark Challenge - The students have chosen their landmark and have written 9 clues about this landmark. In March, they will build a model to scale. To learn more click here. Doodle For Google- Integrating with art, the students have been preparing their Doodle for this annual competition. They have learned about perspective, value, and blending. All the students have written stories about their theme for their drawing. To learn more click here. Civil Rights - the students have been working hard on performing a reader's theater about Rosa Park and the Montgomery Bus Boycott. As part of this unit students learned about writing persuasion letters. For the month of the January, the students focused on creating a video that captured the legacy of the Cannon Ski Mountain which sits in our backyard. The students interviewed over 5 experts on Cannon including JD, the mountain manager at Cannon and Meghan McPhaul, the author of "A History of Cannon Mountain." They captured over 5 hours of video footage and hundreds of still photos. In the last two weeks the students edited all this footage into one five minute video. It is being submitted to the Ski NH video contest. Enjoy! Today, Governor Lynch, the governor of New Hampshire, came to visit our school. The reason for his visit was to meet the students and also receive a NH mural my students from last year made for the governor. Students from each classroom got to ask one question of the governor and then the governor asked the students questions. Before the governor left, everybody got to shake his hand. The students were sad to see the governor go and were surprised to see that he drove off in a minivan. Since Thanksgiving the students having been learning about character development by explore Ebneezer Scrooge in "A Christmas Carol" by Charles Dickens. The students have made busts of Scrooge to show the different emotions he has during the visits by the Ghost, and they acted out a reader's theater of the novella. In the end the students showed their understanding by taking the role of Scrooge and writing a letter to the Grinch to prevent him from carrying out his "awful, wonderful idea". Last Friday, the Hampstead Players came in and performed an adaptation of the "Christmas Carol". On Friday, Dec 19th, the fourth grade met with Dr. Umashankar, a neurologist in our community. In this hour the students learned about the nervous system, the brain and the spinal cord. Dr. Umashankar brought in brain scans, EEG, and models for the students to explore. Many students afterwards felt inspired to study the nervous more and amazed at all the functions of the brain. Yesterday the fourth grade received their indestructible soccer ball from the One World Futbol organization. The mission of this organization is deliver indestructible balls all around the world, so everybody has an opportunity to play no matter how much poverty or violence surrounds them. The fourth grade raised money among themselves to purchasing two balls, one for our school and one to be donated to Save the Children foundation. To learn more about this organization read this NY Times article. In addition to spreading kindness around the world, the fourth grade also decided to help our local community by baking Red Velvet Cakes from scratch for the Lions Club holiday baskets. 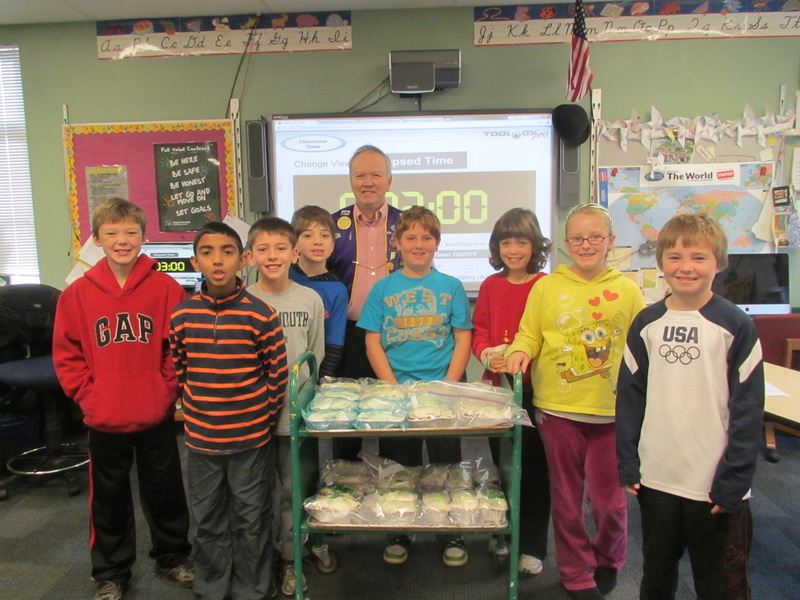 The fourth grade baked 30 cakes for the baskets which are given to families in need. Right after Thanksgiving the students learned about micro financing and the organization of KIVA. Keeping up the tradition of last year's class, the students found people around the global with strong business ideas and in need of a little support to meet their basic needs. The students in $25 increments made of 7 loans to different people to support their business ideas. Over time, these people will hopefully repay the money the students have lent so we can keep on providing loans for people in need of a extra support.